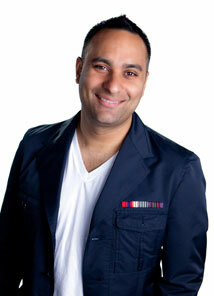 Russell Peters is already a comedy superstar in much of the world. During a recent tour of Dubai, Peters sold tickets at the rate of one ticket every two seconds, crashing all the online sales outlets as soon as the tickets went on sale. In April 2005, Peters was the first South Asian to headline and sell out the Apollo Theater in New York City. In June 2007, Peters became the first comedian to sell out Toronto’s Air Canada Centre, performing for over 30,000 fans over two nights. In addition to this first time feat, in February 2008, Peters became one of only a handful of comedians to ever headline and sell out the world famous Madison Square Garden. Peters has been nominated for four Gemini Awards, which are the Canadian equivalent of the Emmy Awards. He has been featured at the Montreal Just for Laughs Comedy Festival, HBO’s The Comedy Festival in Aspen, the Edinburgh Festival in Scotland, and many others across the globe. His television appearances include CBC’s Comics! and two one hour Comedy Now! specials on the Comedy Network in Canada. His Comedy Now! performance of February 2004 is one of the network’s most popular shows of all time. When fans placed segments of the special on the internet, it created a global demand for Peters' comedy and his popularity exploded. His YouTube videos have been viewed by over 20 million individual viewers. His website, www.russellpeters.com, gets over 10,000 hits a day and alerts his many fans about his upcoming shows via targeted email blasts. He’s performed sold-out tours of China, South Africa, Australia, Sri Lanka, Vietnam, Jamaica, St. Maartens, Trinidad, Singapore, and the United Arab Emirates, and in 2007, was the first North American comic to tour India. In 2007, Peters completed two USO tours for the troops. During these tours he performed on the USS Dwight D. Eisenhower and in Iraq, Afghanistan, Djibouti, and Greenland. He was part of a special Thanksgiving tour for the troops with the Vice Chairman of the Joint Chiefs of Staff, General Cartwright. Peters' comedy is rooted in the reality of growing up brown in a white Canadian society. "My family and I are Anglo-Indian," Peters explains. "Anglo-Indians are a community of Indians from India who mixed with the British when they occupied India. Both of my parents are Anglo-Indian and their parents were Anglo-Indians and so on."